If someone had predicted that Magnus Carlsen and Levon Aronian would be leading the Tata Steel Chess tournament (3/4), it would not be much of a surprise. The tournament has been rather competitive with Fabiano Caruana putting in a strong performance in joint second with Teimour Radjabov on 2.5/4. There is a quintet of players at 50% (Vassily Ivanchuk, Anish Giri, Loek Van Wely, Veselin Topalov, Sergey Karjakin). 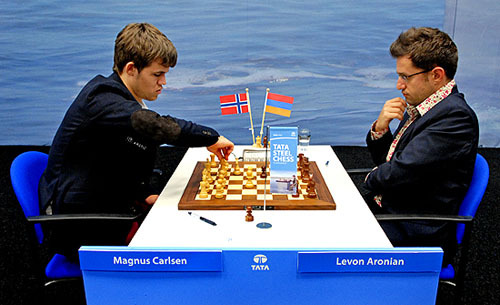 Magnus Carlsen won against Levon Aronian, but the two share joint 1st after four rounds. Photo by Frits Agterdenbos of ChessVista. Hikaru Nakamura had hoped to be in a better position to defend his title, but has not been able to break through in the win column. He lost a crucial game against Aronian, but there are still nine rounds left. A disappointing performance by World Challenger Boris Gelfand who seems to be duplicating the lackluster results of his future opponent Viswanathan Anand. Both are perhaps saving preparation. Gata Kamsky is also having a tough tournament as is Vugar Gashimov. David Navara is last on -2.